Citation Information: J Clin Invest. 2004;113(9):1243-1243. https://doi.org/10.1172/JCI119998. Citation Information: J Clin Invest. 2004;113(9):1244-1245. https://doi.org/10.1172/JCI21836. Citation Information: J Clin Invest. 2004;113(9):1246-1247. https://doi.org/10.1172/JCI21880. Citation Information: J Clin Invest. 2004;113(9):1248-1248. https://doi.org/10.1172/JCI21837. Citation Information: J Clin Invest. 2004;113(9):1249-1251. https://doi.org/10.1172/JCI21761. What are the true origins of the smooth muscle cells (SMCs) present in the intimal lesions of transplant arteriosclerosis? A new study in the JCI shows that Sca-1+ cells purified from the mouse aortic root can migrate through an irradiated vein graft to the neointima of the vessel and transdifferentiate to express the early SMC differentiation marker gene SM22. Do Sca-1+ cells transdifferentiate into SMC-like cells, or is activation of SMC marker genes a consequence of fusion of these cells with preexisting SMCs, a possibility raised by results of studies of adult stem cells in animal models of liver regeneration ? Or could this be bona fide transdifferentiation that recapitulates the pathologic processes in humans? Citation Information: J Clin Invest. 2004;113(9):1251-1253. https://doi.org/10.1172/JCI21441. The anemia of inflammation, commonly observed in patients with chronic infections, malignancy, trauma, and inflammatory disorders, is a well-known clinical entity. Until recently, we understood little about its pathogenesis. It now appears that the inflammatory cytokine IL-6 induces production of hepcidin, an iron-regulatory hormone that may be responsible for most or all of the features of this disorder. Hold the antioxidants and improve plasma lipids? Citation Information: J Clin Invest. 2004;113(9):1253-1255. https://doi.org/10.1172/JCI21637. Intrahepatic proteolysis is a major determinant of secretion of ApoB-containing lipoproteins into plasma. Stimulation of post-ER presecretory proteolysis (PERPP) of ApoB by n-3 polyunsaturated fatty acids has been found to result in reduced secretion of VLDL particles by hepatocytes. A new study has shown that this stimulation is promoted by pro-oxidant conditions that result in increased hepatic lipid hydroperoxide content. Conversely, PERPP is suppressed by antioxidants and by saturated fatty acids, which are not susceptible to lipid peroxidation. Hence reduction of oxidative stress may have the unexpected side effect of increasing plasma lipid levels. Citation Information: J Clin Invest. 2004;113(9):1255-1257. https://doi.org/10.1172/JCI21470. The gene encoding dysbindin-1 has recently been implicated in susceptibility to schizophrenia. 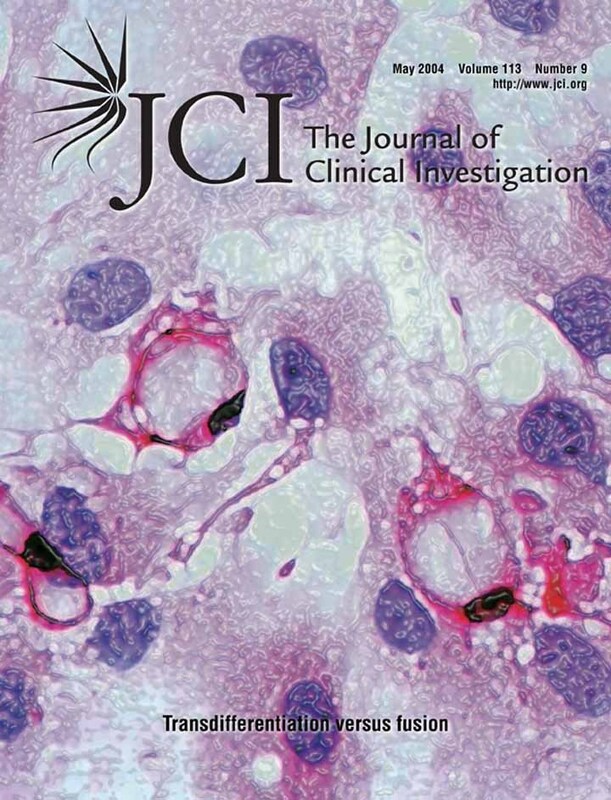 In this issue of the JCI, Talbot et al. show that, contrary to expectations, dysbindin-1 is located presynaptically in glutamatergic neurons and is reduced at these locations in schizophrenia . Further studies of dysbindin-1 and the proteins with which it interacts can be expected to throw light on the pathogenesis of schizophrenia. Citation Information: J Clin Invest. 2004;113(9):1258-1265. https://doi.org/10.1172/JCI19628. Recent evidence indicates that vascular progenitor cells may be the source of smooth muscle cells (SMCs) that accumulate in atherosclerotic lesions, but the origin of these progenitor cells is unknown. To explore the possibility of vascular progenitor cells existing in adults, a variety of tissues from ApoE-deficient mice were extensively examined. Immunohistochemical staining revealed that the adventitia in aortic roots harbored large numbers of cells having stem cell markers, e.g., Sca-1+ (21%), c-kit+ (9%), CD34+ (15%), and Flk1+ cells (4%), but not SSEA-1+ embryonic stem cells. Explanted cultures of adventitial tissues using stem cell medium displayed a heterogeneous outgrowth, for example, islands of round-shaped cells surrounded by fibroblast-like cell monolayers. Isolated Sca-1+ cells were able to differentiate into SMCs in response to PDGF-BB stimulation in vitro. When Sca-1+ cells carrying the LacZ gene were transferred to the adventitial side of vein grafts in ApoE-deficient mice, β-gal+ cells were found in atherosclerotic lesions of the intima, and these cells enhanced the development of the lesions. Thus, a large population of vascular progenitor cells existing in the adventitia can differentiate into SMCs that contribute to atherosclerosis. Our findings indicate that ex vivo expansion of these progenitor cells may have implications for cellular, genetic, and tissue engineering approaches to vascular disease. Citation Information: J Clin Invest. 2004;113(9):1271-1276. https://doi.org/10.1172/JCI20945. Hypoferremia is a common response to systemic infections or generalized inflammatory disorders. In mouse models, the development of hypoferremia during inflammation requires hepcidin, an iron regulatory peptide hormone produced in the liver, but the inflammatory signals that regulate hepcidin are largely unknown. Our studies in human liver cell cultures, mice, and human volunteers indicate that IL-6 is the necessary and sufficient cytokine for the induction of hepcidin during inflammation and that the IL-6–hepcidin axis is responsible for the hypoferremia of inflammation. Citation Information: J Clin Invest. 2004;113(9):1277-1287. https://doi.org/10.1172/JCI19197. How ω-3 and ω-6 polyunsaturated fatty acids (PUFAs) lower plasma lipid levels is incompletely understood. We previously showed that marine ω-3 PUFAs (docosahexaenoic acid [DHA] and eicosapentaenoic acid) stimulate a novel pathway, post-ER presecretory proteolysis (PERPP), that degrades apolipoprotein B100 (ApoB100), thereby reducing lipoprotein secretion from liver cells. To identify signals stimulating PERPP, we examined known actions of ω-3 PUFA. In rat hepatoma or primary rodent hepatocytes incubated with ω-3 PUFA, cotreatment with the iron chelator desferrioxamine, an inhibitor of iron-dependent lipid peroxidation, or vitamin E, a lipid antioxidant, suppressed increases in thiobarbituric acid–reactive substances (TBARSs; a measure of lipid peroxidation products) and restored ApoB100 recovery and VLDL secretion. Moreover, ω-6 and nonmarine ω-3 PUFA, also prone to peroxidation, increased ApoB100 degradation via intracellular induction of TBARSs. Even without added fatty acids, degradation of ApoB100 in primary hepatocytes was blocked by desferrioxamine or antioxidant cotreatment. To extend these results in vivo, mice were infused with DHA, which increased hepatic TBARSs and reduced VLDL-ApoB100 secretion. These results establish a novel link between lipid peroxidation and oxidant stress with ApoB100 degradation via PERPP, and may be relevant to the hypolipidemic actions of dietary PUFAs, the basal regulation of ApoB100 secretion, and hyperlipidemias arising from ApoB100 overproduction. Citation Information: J Clin Invest. 2004;113(9):1288-1295. https://doi.org/10.1172/JCI18555. We evaluated the effects of E2F1 on glucose homeostasis using E2F1–/– mice. E2F1–/– mice show an overall reduction in pancreatic size as the result of impaired postnatal pancreatic growth. Furthermore, these animals have dysfunctional β cells, linked to impaired PDX-1 activity. Because of the disproportionate small pancreas and dysfunctional islets, E2F1–/– mice secrete insufficient amounts of insulin in response to a glucose load, resulting in glucose intolerance. Despite this glucose intolerance, E2F1–/– mice do not develop overt diabetes mellitus because they have insulin hypersensitivity, which is secondary to a diminished adipose tissue mass and altered adipocytokine levels, which compensates for the defect in insulin secretion. These data demonstrate that factors controlling cell proliferation, such as E2F1, determine pancreatic growth and function, subsequently affecting metabolic homeostasis. Citation Information: J Clin Invest. 2004;113(9):1296-1306. https://doi.org/10.1172/JCI20295. Chronic intestinal inflammation, as seen in inflammatory bowel disease (IBD), results from an aberrant and poorly understood mucosal immune response to the microbiota of the gastrointestinal tract in genetically susceptible individuals. Here we used serological expression cloning to identify commensal bacterial proteins that could contribute to the pathogenesis of IBD. The dominant antigens identified were flagellins, molecules known to activate innate immunity via Toll-like receptor 5 (TLR5), and critical targets of the acquired immune system in host defense. Multiple strains of colitic mice had elevated serum anti-flagellin IgG2a responses and Th1 T cell responses to flagellin. In addition, flagellin-specific CD4+ T cells induced severe colitis when adoptively transferred into naive SCID mice. Serum IgG to these flagellins, but not to the dissimilar Salmonella muenchen flagellin, was elevated in patients with Crohn disease, but not in patients with ulcerative colitis or in controls. These results identify flagellins as a class of immunodominant antigens that stimulate pathogenic intestinal immune reactions in genetically diverse hosts and suggest new avenues for the diagnosis and antigen-directed therapy of patients with IBD. Citation Information: J Clin Invest. 2004;113(9):1307-1317. https://doi.org/10.1172/JCI17323. Here we describe the effect of immunization with dendritic cells loaded with syngeneic tumor cells (DC/Ts) by polyethylene glycol treatment, on tumor development in adenomatous polyposis coli (APC) gene mutant mouse models, APC1309 and APCMin–/+, in which adenomatous polyps of the gastrointestinal tracts develop with a high incidence. Treatment with DC/Ts prevented the development of gastrointestinal tumors, and coadministration of DC/Ts and IL-12 caused a further reduction in tumor incidence. Splenocytes from APC1309 mice treated with DC/Ts and IL-12 showed no cytotoxic activity toward the tumor cells, but serum antibody specific to them was detected. IgG from the treated mice exhibited cytotoxic activity against the tumor cells in vitro. Predominance of Th2 cell response over Th1 response was also suggested by ELISPOT assays in the treated mice. Depletion in vivo of CD4+ T cells, not CD8+ T cells, by the intraperitoneal administration of corresponding mAb’s decreased the antitumor effect of DC/T inoculation. Immunofluorescence microscopic studies showed that Ig was attached to tumor cells in mice treated with DC/Ts and IL-12. These findings indicate that DC/T vaccination prevents tumor development through APC gene mutation and that its preventive effects are mediated by humoral antitumor immunity. Citation Information: J Clin Invest. 2004;113(9):1318-1327. https://doi.org/10.1172/JCI19930. Pre–B cell colony-enhancing factor (PBEF) is a highly conserved 52-kDa protein, originally identified as a growth factor for early stage B cells. We show here that PBEF is also upregulated in neutrophils by IL-1β and functions as a novel inhibitor of apoptosis in response to a variety of inflammatory stimuli. Induction of PBEF occurs 5–10 hours after LPS exposure. Prevention of PBEF translation with an antisense oligonucleotide completely abrogates the inhibitory effects of LPS, IL-1, GM-CSF, IL-8, and TNF-α on neutrophil apoptosis. Immunoreactive PBEF is detectable in culture supernatants from LPS-stimulated neutrophils, and a recombinant PBEF fusion protein inhibits neutrophil apoptosis. PBEF is also expressed in neutrophils from critically ill patients with sepsis in whom rates of apoptosis are profoundly delayed. Expression occurs at higher levels than those seen in experimental inflammation, and a PBEF antisense oligonucleotide significantly restores the normal kinetics of apoptosis in septic polymorphonuclear neutrophils. Inhibition of apoptosis by PBEF is associated with reduced activity of caspases-8 and -3, but not caspase-9. These data identify PBEF as a novel inflammatory cytokine that plays a requisite role in the delayed neutrophil apoptosis of clinical and experimental sepsis. Citation Information: J Clin Invest. 2004;113(9):1328-1333. https://doi.org/10.1172/JCI18838. The MHC class I family–like Fc receptor, FcRn, is normally responsible for extending the life span of serum IgG Ab’s, but whether this molecule contributes to autoimmune pathogenesis remains speculative. To determine directly whether this function contributes to humoral autoimmune disease, we examined whether a deficiency in the FcRn heavy chain influences autoimmune arthritis in the K/BxN mouse model. FcRn deficiency conferred either partial or complete protection in the arthritogenic serum transfer and the more aggressive genetically determined K/BxN autoimmune arthritis models. The protective effects of an FcRn deficiency could be overridden with excessive amounts of pathogenic IgG Ab’s. The therapeutic saturation of FcRn by high-dose intravenous IgG (IVIg) also ameliorated arthritis, directly implicating FcRn blockade as a significant mechanism of IVIg’s anti-inflammatory action. The results suggest that FcRn is a potential therapeutic target that links the initiation and effector phases of humoral autoimmune disease.